You’ll never know unless you ask. A well planned survey can provide information to help you learn the “voice of your market”. Marketers can get a go od idea of customer preferences by analyzing a business’s existing records: Clients, Inventory or Services, Sales Orders, etc. These record can eliminate guesswork since they reveal where clients who bought voted with their dollars. However, looking at historical behavior is only half the story that tells you the past voice of your market. But what about your market’s future voice? The investment mantra that states, “Past results are no indicator of future performance” is somewhat relevant. So how can you reduce the guess work about future customer preferences. Nowadays, it seems that every time you conclude an online transaction, you get a request to “take a survey”. This is a transactional survey. These surveys are measuring your “transactional experience.” These surveys measure a past experience. However, when they are requested after every transaction are simply annoying. Then there’s the market research survey. This type of survey seeks to measure its respondent’s preferences with a broader scope. 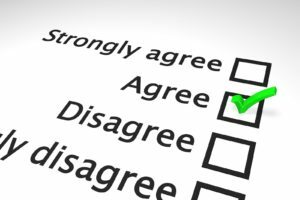 During the recent election season, we may have received one or more opinion surveys. The results of these surveys are ambiguous at best. Are they sent to determine vote preferences or to influence their positions? Experience surveys measure overall experiences like employee satisfaction or healthcare satisfaction. There are a number of factors that determine the success of any survey. Motivating respondents with incentives should balance budget with relevance. Read 7 Things to Remember When Choosing Survey Incentives at Survey Gizmo. Above all your survey should be easy to take and as short as possible. Balance the completeness you need with the length of your survey by using conditional tests to skip survey segments that are not relevant. So don’t guess. Ask. If you identify the right number of motivated respondents, the market information you receive will be meaningful and therefore, allow you to target your market with improved accuracy and precision.